cNovember 2nd sees the release of a superb, new 6-disc boxed set encapsulating legendary English rock-band Mott the Hoople’s recorded output for Island Records, to whom they were signed, between 1969 and 1971. Bringing together all of their albums from the period, the set also includes bonus material plus BBC sessions and live concerts. The studio albums have all been remastered from the original tapes (where available) by renowned engineer Andy Pearce and have been complemented by bonus tracks selected by Mott the Hoople expert, Kris Needs. Disc 5 comprises more unheard and, in some cases, unreleased music from the Island archive and Disc 6 rounds everything off with live material recorded at Fairfield Hall, Croydon on 13th September 1970 plus a BBC Radio One In Concert from the Paris Theatre, London on 30th December 1971. The CDs are housed in a shoe box style package with a 50-page booklet designed by Phil Smee who scoured the archives for rare photos and memorabilia, tracing the evolution of the band. It is completed with comprehensive sleeve notes by Kris Needs. Mott the Hoople were one of the most prolific and important British rock bands of the early 1970s and have been cited as a major influence by members of a raft of subsequent groups, including Queen, Def Leppard, Oasis, R.E.M., Kiss, Motley Crue and The Clash. They continue to perform, in their current line-up, with Ian Hunter at the helm. 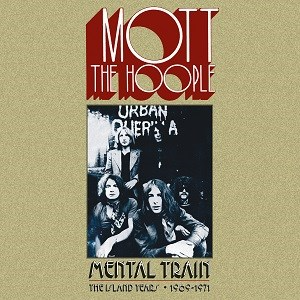 Pre-order the boxset, available November 2nd at mottthehoople.lnk.to/MentalTrain & listen to a previously unreleased version of “Rock and Roll Queen” from the set, here.